Military Record -- Starting World War III? 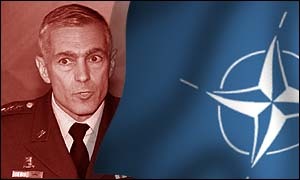 Wesley Clark Wesley Clark has the most impressive resume of any candidate since, well, Bill Clinton -- first in his class at West Point, Rhodes Scholar, Masters in Economics at Oxford, decorated veteran, 4-star general, commander of NATO forces during the war in Kosovo. By all accounts, he is very bright, very energetic, and -- many people say -- also brusque, arrogant, and prone to piss people off. Is he Clinton without the scandals, or another over-achieving bundle of trouble from Arkansas? In any case, he is also, apparently, brave. Besides the fact that he actively served in the military, was wounded, received several medals and rose to the top of the ranks, we have the anecdotes of Richard Holbrooke, the former Ambassador to the United Nations and before that Clark's boss at the Dayton Peace Accord negotiations. Clark had an extremely successful career in the Army. Besides rising to the rank of 4-star general and commander of NATO forces, leading the war in Kosovo (which we won in 78 days without a single casualty), he is said to be the most decorated veteran since Dwight D. Eisenhower. Clark has received the following medals: a Silver Star, 2 Bronze Stars, a Distinguished Service medal, a Defense Distinguished Service medal, a 2 Meritorious Service medals, 4 Legion of Merit Medals, 2 Army Commendation medals, and a Purple Heart. But that doesn't mean that his record is uncriticized. The Clinton administration cut short his stint as NATO commander by 3 months after repeated conflicts with the Army (he wanted more Apache combat helicopters in Kosovo) and with Michael Jackson (the British General, not the child-craving singer), who was commanding British forces there. Generally speaking, Clark wanted to pursue the war more aggressively than those he beefed with. At the very end of the war, after Slobodan Milosevic finally gave up under withering NATO bombing, Russia demanded that they control a section of Kosovo, though they weren't (then) in NATO. (Russia has traditionally been a close ally of the Serbians, whose attacks on Albanians in Kosovo triggered this war, and Albanians rightly feared living under a Russian controlled, pro-Serbian government.) Clark flatly refused any Russian control, and -- despite promising not to -- the Russians sent 200 troops to take over Kosovo's main airport, as a power play. Clark, who had negotiated with Milovic, Serbia and Russia in the Dayton Peace Accords, was determined not to let that ploy work. With the approval of Javier Solana, the NATO leader, he ordered British troops to occupy the other end of the airport -- where there were few if any Russian troops -- and prevent Russia from flying in more troops to build up their presence. British general Michael Jackson refused in a way Clark called "emotional." Involved in the Waco Raid? The raid was carried out by FBI agents, but it has been established that Texas Governor Anne Richards consulted with a military official at Fort Hood, Texas (where Clark was stationed at the time), that 2 military officials from Fort Hood met with Attorney General Janet Reno's staff in Washington before the raid, and the Fort Hood provided military equipment including tanks and Bradley Fighting Vehicles to the FBI raiders. This much is pretty well documented fact. A link to Clark is not. For one thing, the people alleging such links are pretty much all conspiracy types falling into one of three categories: liberal anti-war types, conservative conspiracy types, and Serbian-Americans stilled pissed over Kosovo. More importantly, the evidence just isn't there. They best they can do is claim that the Army secretly carried out the raid (though even anti-Waco films show FBI agents driving the tanks and carrying out the raid), or that the two military officers who went to Washington are unknown, but it might have been Clark. Most don't even try that hard, just blindly asserting that Clark ran the whole raid and loves to butcher people. "Waging Modern War: Bosnia, Kosovo and the Future of Combat," (book) by Wesley Clark (2001). Chapter 15 is entirely about the incident with the Russian troops and General Jackson.